Happy Monday, my bookish friends! Today is an extra happy Monday for me because I fly to Oregon this Friday to spend a week and a half visiting my boyfriend's family and friends. I'm feeling overdue for some rest and relaxation; I've already mentioned a few times how this month has been a doozy work-wise, and I think a set change is just what I need to settle my brain down. On top of all the swimming, hiking and reading I'll be doing at his mom's house, I also get to celebrate my 24th birthday by camping out at a giant party in the middle of the woods. What more could a girl ask for? Due to woodland frolicking and complete lack of Internet, things are going to slow down a bit over here, but I'm hoping to schedule at least one or two posts to go up while I'm gone. Maybe I'll crank out some of my wildly overdue reviews! It's good to have goals. Comment replies and blog visiting will also grind to a halt; I fully expect you all to fill my Feedly with excellent things for me to come back to. 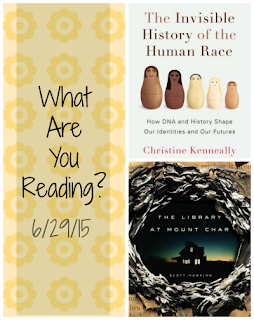 Before I leave for vacation, I'm racing against an interlibrary loan due date to finish up The Invisible History of the Human Race: How DNA and Our History Shape Our Identities and Our Futures by Australian journalist Christine Kenneally. The book came highly recommended by Heather from Bits n Books, and I'm enjoying Kenneally's exploration of genealogy and how attitudes about it have shifted over time. I'm crossing my fingers that I finish up with enough time to write about it before my traveling starts. I also received some fabulous book mail last week in the form of The Library at Mount Char by Scott Hawkins. I've only read a handful of pages so far, but I'm already sucked in by the creepy. This one may end up going to Oregon with me, along with a few other selections that I hope to share later this week. I'll also share how ready my boyfriend is to leave me at home rather than help me lug books on vacation. What books have you got on tap for the week? Talk to me! That sounds like a fabulous vacation. I've found that I kind of live for long stretches free from the internet - so I'd love that! This is the first I'm hearing of The Invisible History of the Human Race, but I'm definitely intrigued! Have a wonderful, wonderful vacation and happy birthday! A party in the woods actually sounds like fun, even if the woods are not necessarily my thing. I just ordered a copy of The Library at Mount Char. I love creepy and just couldn't stay away! Yes, I'm so, so excited! It's going to be great not to be glued to a screen for a while. I'm really digging it so far—I'm about at the halfway mark! Kenneally is writing about things I've never thought about before, and it's so fascinating. My one gripe is that occasionally she throws out stats/facts without including an endnote, so it can be a bit of a bother trying to Google for more info, but in general she's pretty thorough with her citations. Oh, yay! I hope you love it. Yay vacation! Oregon is on my list of pretty places I need to go some day. I also just broke down and requested the Library at Mount Char. I can't wait! Happy almost your birthday! That sounds like an incredible way to celebrate your birthday - have so much fun! And looking forward to your thoughts on both of those books, they sound great. Super interested to hear how The Library at Mount Char treats you! Have a great vacation! Happy birthday for whichever day it's on! 24 ... I barely remember being that young. Cling to it for dear life (that's my sagely advice). I hope you have a nice time away and props to you for the doing the camping thing. I haven't done that since I was really little - I much prefer the comfort of my own bed! The Library at Mount Char sounds like the perfect book to take away on vacation. And I'm really glad you're enjoying Invisible History. I learnt so much from it. Your trip to Oregon sounds amazing. (Can I come?!) Happy early birthday! You must! It's so lovely... I really enjoy the fact that they have seasons but they aren't as dramatic as in other places (cough New England/Midwest cough). So, so thrilled about Mount Char! It's first up on my list of airplane reads. And I'm nearly there with Invisible History—fingers majorly crossed that I find the time to read the last 85 pages or so tonight! I am too, especially considering the general hype train... I hope it lives up! Oh, I definitely prefer my bed and air conditioning too, but it's so fun to spend some time outside every now and again. I'm sure I'll be ready to get back on a mattress when all is said and done. Book your ticket, lady! I'll clear out space in the tent. I'm not even kidding when I say I could have written that comment - except I crochet (can't knit for the life of me) and I don't have cat...yet. And, funnily enough, I only know how to crochet too. I aspire to knit someday, though.